Signs inform people that there's no smoking on the property of Riverview Apartments Thursday, Nov. 9, in Avon. The property has been smoke-free for the past year. With the Great American Smokeout approaching on Thursday, Nov. 16, Mandy Ivanov, health promotion coordinator for Eagle County Public Health, noted that Colorado’s quit line offers support and tools — such as nicotine gum or patches or prescription medication — for free. The number to call is 1-800-QUIT-NOW. AVON — Ask any random smoker, and you will likely hear that he or she would like to kick the habit. But as anyone who as actually tried to do so will say, it takes a whole lot more than simple desire to quit smoking. Thursday, Nov. 16, marks the American Cancer Society’s Great American Smokeout — a national effort to encourage smokers to quit. 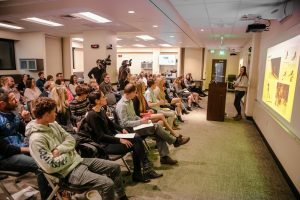 This month also marks the one-year anniversary of an Eagle County program aimed at reducing tobacco use locally. 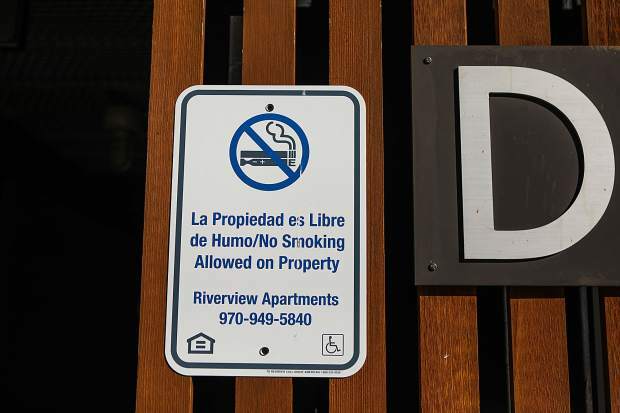 One year ago, as part of a Denver Health study, the county instituted a tobacco-free policy at its Riverview Apartments project in Avon. 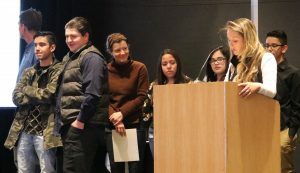 “We didn’t get a lot of push-back when we instituted the program because there was probably only a handful of smokers on the property,” said Mandy Ivanov, health promotion coordinator for Eagle County Public Health. 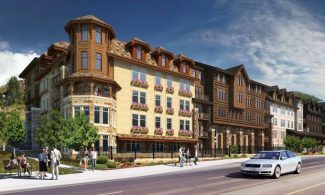 But because Riverwalk is home to several young residents, Ivanov said it was a great target property. She noted that statistically, 18- to 20-year-olds are a high tobacco use group. “We wanted to start where we could have the biggest impact,” Ivanov said. Last March, a baseline survey of Riverview residents showed that 79 percent of the respondents lived in tobacco-free homes. However, that same survey showed that 46 percent of the respondents were bothered by second-hand smoke coming into their homes. Additionally, 17 percent of the respondents said they were worried about the health impact of second-hand smoke. And, tellingly, the survey revealed that 50 percent of the people who did use tobacco products expressed the desire to quit. • It helped me reduce smoking and that was because of a combination of the policy and other reasons. Neighbors have also stopped or reduced. 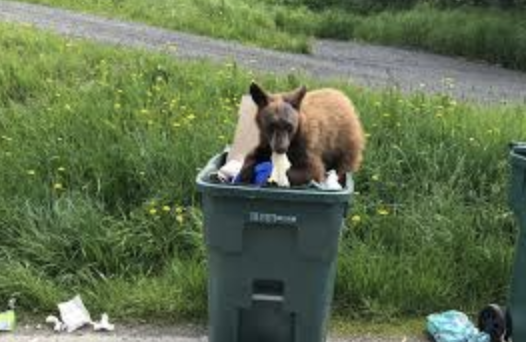 • My neighbor doesn’t smoke anymore. I don’t see the butts on the ground, and the smell isn’t there anymore. • There were kids that would gather and smoke; they have disappeared. • I smoke less cigarettes and it’s hard to go outside and smoke, especially in the winter. In two days, I smoke two cigarettes a day; before, I smoked two packs in a day. Ivanov noted that the tobacco-free regulation at Riverview wasn’t presented as a heavy hammer. “We emphasize that if someone is trying to quit, having residual smoke can be a trigger,” Ivanov said. She stressed that the county wants to assist smokers in their efforts to quit, not shame them for their behavior. “Smoking has become very stigmatized,” Ivanov said. “We do recognize that it is a addiction and it takes an average of seven to nine times for a person to quit.